This entry was posted on April 14, 2019 by Menzie Chinn. Oh oh! The storage model that we asked CoRev to work on. How come we have not seen this model published in the American Economic Review? Could it be that the editors of AER have questioned CoRev’s data sources? Menzie why? Because only a few insiders know the contents and discussions of the China Trade Agreement. I take it we are supposed to believe you are one of those insiders? LOL! Maybe you are trading on soybean futures with “inside information” given to you by Wilbur Ross. Be careful as that is illegal. And we are spying on all of your communications. Better get a high powered defense attorney! In fairness, they are citing reporting from Reuters! And yet soybean farmers still support Trump and his trade war with China over intellectual property rights that primarily benefit Silicon Valley. Go figure. Paul Mathis You do not get it. The map of the US went red in 2016. According to the AP, Trump took 2626 of all counties in the US. Hillary only 487. By far, Trump territory includes the bulk of the grain and soybean growing regions. This is the patriotic heartland. It’s also the damaged rust belt, where hopes are that Trump will turn this terrible tide. For reasons of patriotism, the farmer’s proclivity for hard work and alliance with those who are also willing to work hard, and empathy with rust-belt businesses and workers who in most cases are relatives of the farmers, soybean farmers stand mostly united behind this president even though their bottom line may suffer temporarily. The value function of Midwesterners is not just monotonic, as is implicit in your comment. Midwesterners see the damage globalists have done to this country. Trump wasn’t the one who tariffed soybeans. China – globalist if ever there was one – did. And farmers see Trump doing his level best to compensate for this bump in the road as trade negotiations with China remain ongoing. Even as a flurry of US Representatives from urban blue states throw every obstacle possible in his way to sabotage his presidency. One county one vote? What a stooopid comment. Some counties have a couple of 100 people where others have several millions. But I guess a couple of old white hokeys are more worthy than all of us New Yorkers. After all – we in New York celebrate racial diversity whereas your hokey counties are pure lily white. Trump won 16 of 18 counties inNevada and lost by 3%. You get whomped in Clark and Washoe counties where 85 % of votes are cast, you lose. JBH This is the patriotic heartland. I don’t know about your definition of “patriotic” but the “heartland” part is all pacemakers and heart valves. Have you checked the demographics? In Iowa Trump ran strongest in Steve King’s 4th district. Go check the percent of folks age 65 and over in some of those counties. You’ll typically see anywhere from 20%-25% of the folks in those counties are age 65 or older. A lot of those voters won’t be around in 2020. Do you actually know any corn and soybean farmers? Dairy farmers work long and hard. Livestock farmers work long and hard. Fruit and vegetable farmers work long and hard. Soybean and corn farmers work hard for about 6 weeks in the spring and 6 weeks in the autumn. The rest of the time they’re either working part time jobs elsewhere, hanging out at the coffee shop bitching about prices, or waiting for their sons with urban jobs to take time off from work to help bring in the crops. There are about as many female farmers as male farmers, and those female farmers have very different attitudes towards Trump. They also live longer. And age is a problem. The average farmer is 57.5 years old…not exactly a winning electoral dynamic. BTW, restaurant workers work hard. Construction workers work hard. Lots of people work hard. Midwesterners see the damage globalists have done to this country. If only they could see the damage they do to the environment! Trump wasn’t the one who tariffed soybeans. China – globalist if ever there was one – did. True. But Trump was the one who initiated the trade war with China by putting tariffs on Chinese products. Trump was the one who told those gullible farmers that trade wars were easy to win. I agree that a lot of farmers are sticking with Trump; but that only proves Trump’s campaign claim that he could shoot someone in the middle of 5th Ave and his supporters would still stick with him. Translation: farmers like the idea of getting welfare checks from blue state economies. So much for hard working. throw every obstacle possible in his way to sabotage his presidency. Let me fix that: “…throw every obstacle possible in his way to sabotage his Napoleonic ambitions. Is racism or some similar confirmatory bias at work here? The USA has since the 2016 election campaign reinforced its reputation as a country where race, ethnicity and other sectarian criteria are significant influencers of both domestic and international policy. I do not support many of China’s muscular industrial development policies but the “forced technology transfers” accusation was over the top, some would say it was a lie. US firms did not have to sign those contracts, in fact many US firms could have chosen to avoid entering China altogether. It unfortunately creates the impression that Americans are racially-motivated bullies and thugs with a strong sense of entitlement. I fail to see how any of this benefits US-based multinational companies, US material standards of living of US national security over the longer run. I don’t blame donald trump for this, I don’t blame President Obama for this. U.S. Corporations have been taken for FOOLS. They get most of their trade secrets stolen (proprietary or otherwise) from right underneath their nose, with nearly ZERO access the Chinese markets. In a nutshell, China has “drunk our Milkshake”. And now donald trump and the American CEO’s are crying just like Eli Sunday. You can’t blame the other party to a deal just because YOU are the idiot. An American top official got together with some buddies, smoked some really powerful weed, drank a lot of whiskey, came up with a ‘number’ and then ran it through a closed input-output model and after some joyful deliberation decided to use the gross output multiplier results. The Americans are anti-science and anti-expert. Americans have no integrity and they are proven liars. Why should anybody believe this “top American official”? Especially if the top official is behaving like so many special interest groups that do not hesitate to misinform the public for private gain? Incidentally, American and other western-based multinationals and consultants have been sharing technology for decades if not centuries via foreign direct investment. The economics professions tends to view technology transfer as the holy grail of foreign investment and as the key factor as to why host countries should enthusiastically welcome foreign investment. But why would that informative context be added to the discussion when America has evolved into a truth-bending society? I think Menzie keeps posting future prices just to get inside CoRev’s head. After all – it is clear by now that CoRev does not grasp the difference between a current spot price and a futures price. So to make sure we have ALL the “raw” data for our Usual Suspects whine over, here is a chart that shows spot prices through April 15, 2019! Wow – even the spot price is less than $9 a bushel. Pgl, makes this statement: ” it is clear by now that CoRev does not grasp the difference between a current spot price and a futures price.” Really??!!!???? It was you who repeatedly asked me for a July 2019 soybean spot price. I ignored it for the ignorance it demonstrated. The spot price is the current price in the marketplace at which a given asset—such as a security, commodity, or currency—can be bought or sold for immediate delivery….” Immediate delivery is not July 2019 delivery, which would be a b>future delivery and is priced as a future. And, yet you blame others for your ignorance, when you demonstrated it again in your comment. BTW, citing yesterday’s spot price is still not July 2019’s spot price. Perhaps with time and consistent learning, these complex concepts or immediate and future will become clearer. I thank your for playing, because when you do you are an amazement. Do you remember this comment? Keep playing! I do agree: Lord – the stupidity of your trolling BURNS!” Actually it’s hilarious. I see you forgot to post that “data” of yours which was clearly labeled future prices in your discussion of what the spot price was. That was my SIMPLE point which of course you still do not get as you cherry pick and twist a discussion you never understood in the first place. Hey CoRev – try READING the notations in charts including the ones Menzie posts before opening your utterly confused and serially dishonest mouth. Pgl, Keep playing! I do agree: Lord – the stupidity of your trolling BURNS!” Actually it’s hilarious. 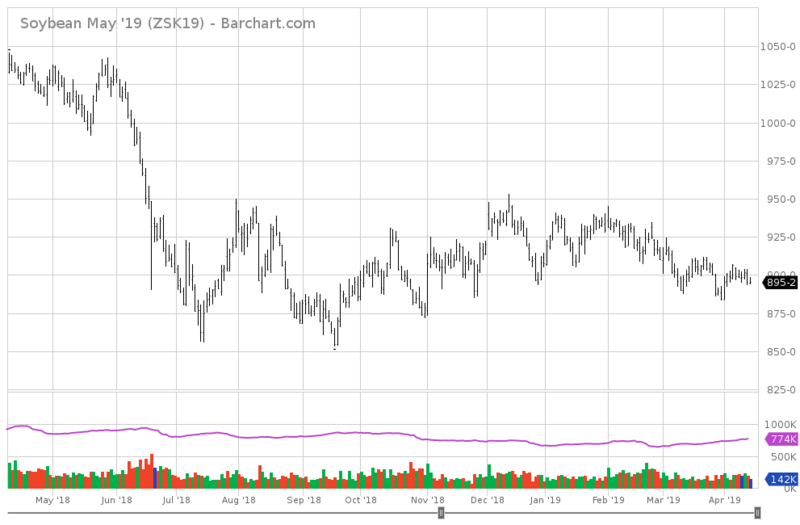 One day we will have spot prices for mid-July, 2019 Menzie’s prediction date, but not until …… mid-July 2019. One day you will also understand the meaning of that statement. Just not today, I guess. If you can predict commodity prices and you are commenting on this blog, you are woefully unemployed.